Buckinghamshire Hospitals NHS Trust (BHT) was established in April 2003 with the formal merger of South Buckinghamshire NHS Trust and Stoke Mandeville Hospital NHS Trust. The Trust serves a combined population of 500,000 with three hospitals – Amersham Hospital, Stoke Mandeville Hospital and Wycombe Hospital. BHT introduced the new National Care Record Scheme (CRS) in October 2006, part of the NHS National Programme for IT (NPfIT) which aims to ensure that every individual’s medical and social history is accessible at any NHS site throughout the UK. To deliver the National Programme, the newly formed NHS department ‘Connecting for Health’ (CfH) divided the country into five clusters. Each of the clusters has the responsibility to deliver and support the rollout of the new IT services. Buckinghamshire Hospitals NHS Trust forms part of the Southern Cluster, which has awarded Fujitsu Systems the contract as Local Service Provider (LSP). It is the role of the LSP to deliver the services locally and support them, either through partnership with the local support organisation or centrally through the new First Line Support Contract. BHT was selected as an early adopter of the CRS and it was quickly identified that it needed to implement an ITIL compliant service management solution to provide support for the new NPfIT systems. Having looked at Pink Verify, the ITIL certification standard, BHT short listed five suppliers. Hornbill’s Supportworks ITSM solution was recommended by the Northumbrian Health Authority and it became apparent very quickly, following a demonstration of the product, that it was the right choice for the Trust. One of the key factors for selecting Supportworks ITSM was its ability to be easily modified to meet the required CfH Minimum Dataset requirements for NPfIT Systems and OTI integration with the LSP. Open Telephony Interface (OTI) allows different service desks to communicate with the Local Service Provider (in this case Fujitsu’s Peregrine based Service Desk), to providing two way updates on the status of all incidents to both support teams. Within the NHS, this communication is termed ‘seamless ticketing’ and although an important part of the requirements, prior to the implementation of Supportworks ITSM there was little knowledge of how this might work. Seamless Ticketing enables the Trust support desk to gather the CfH minimum data set which is required if a call is to be passed to the Local Service Provider (LSP) for resolution. All calls regarding the new Care Records System (CRS) are triaged locally before being referred to the LSP. Once the LSP has dealt with the call, data is sent back to the Trust and this data is then fed back into Supportworks ITSM for the call to be closed. This two- way communication has been key to the success of the project. BHT has a single service desk which provides first line support, including advice and guidance on all BHT IT supported applications. The Service Desk aims to provide a first time fix to 70% of callers. In total, the Trust supports over 5,000 users with the majority at the Wycombe and Stoke Mandeville sites. The service desk handles around 3,500 calls per month, of which 2,750 are inbound. Volumes have increased 30% since CRS went live and with the minimum data requirement calls take longer to log, yet the service desk has been able to cope with this demand and improved service levels to customers. Seamless Ticketing has also helped significantly – without this in place the service desk would have to phone calls through to the National Service desk, greatly increasing outbound traffic and reducing inbound capability. When the Trust Service Desk passes a call to the LSP desk, the resolution countdown clock on its own SLA starts running, and counting down on the LSP’s service agreement. Both clocks can be seen at a local level, so that each IT team can quickly see when they are about to breach a service target. 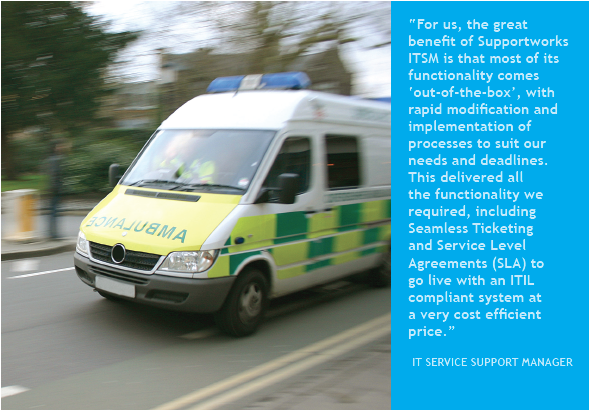 Following the success of Supportworks ITSM in the IT arena, it has been rolled out to other departments within the Trust – Radiology, Business Change, Registration Authority and Information Governance. As an example, the Radiology Department has two specialist IT Support personnel who look after their systems. By giving them access to Supportworks, the Service Desk is able to handle their calls and leave them more time to deal with second and third line support. Also it enables IT to have an overview of what is going on in IT terms in other departments. Modifications were also made to meet the Trust’s SLA requirements that it had already in place and the new CfH NPfIT contractual SLAs. Supportworks was easily adapted to automate these requirements.